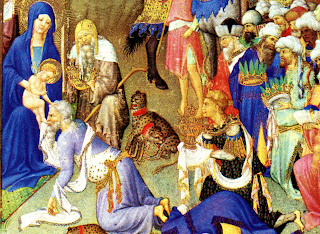 This is another Palaiologos being one of the three kings: here, Manuel II in a French manuscript after his visit to Paris in 1401-02. He, too, is shown with cheetahs. This has made me think that I have to walk back some of last week's comments on the leopard-wranglers. Hunting- leopards, that is, cheetahs. Once I gave it a little thought, I realized that there was no way Manuel was traveling with a retinue that included cheetahs and their handlers. Manuel was humiliatingly poor. He had to leave his family in Monemvasia because the Turks were besieging Constantinople and the City was threatened with starvation. When he got to Venice to ask for help, he had to borrow money for his trip to France. In France and England he depended on the kindness of strangers, and on his way home his Venetian creditors held up his passage for five weeks until repayment terms were arranged. When he got home, he sent thank-you presents of a family portrait and pieces of the assorted relics in the keeping of the imperial family. It had been a long time since the Eastern Empire could afford to send silks and jeweled crosses and golden chalices for gifts. 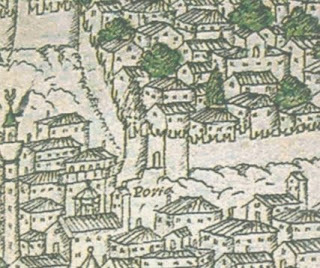 Which made me rethink John's trip to Ferrara-Florence in 1437-39 and the likelihood of his taking along any cheetahs. Despite my enthusiasm last week, no likelihood whatsoever. 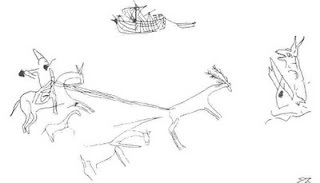 He and nearly 700 Greeks traveled on Venetian ships, going and returning in winter. 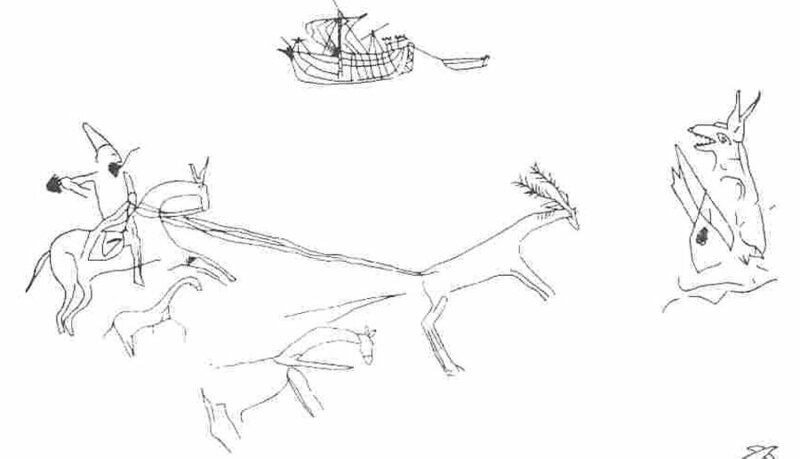 When John got to the Morea, he disembarked -- he hated ships -- rode by land across the peninsula and reboarded on the other side. He, too, was depending on the kindness of strangers to pay for the trip. 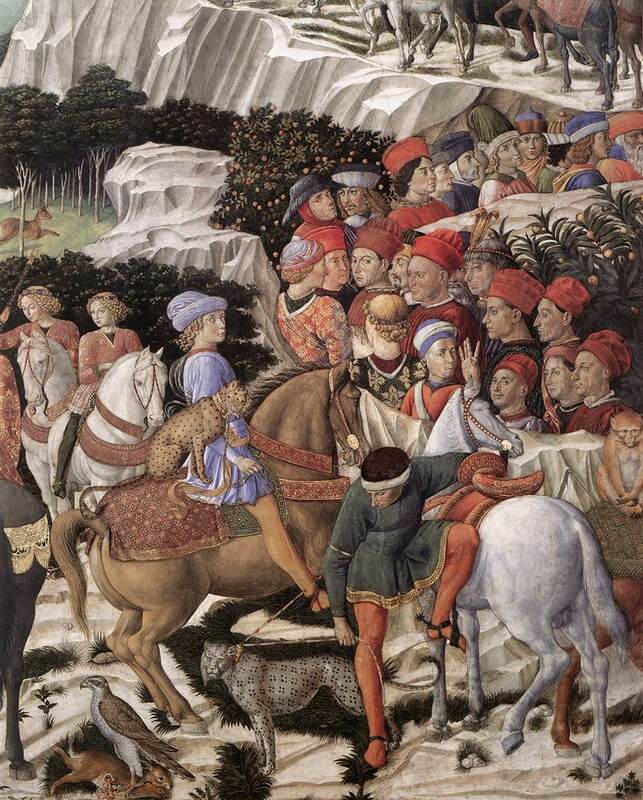 He didn't take any horses on the ships, and when he got to Ferrara he had to buy them from the Russian delegation so he could hunt. The Italians complained about his hunting and the damage it did to the peasant farms, but no one mentioned the hunting leopards, and no one depicted them at the time. If he had had leopards, Pisanello would have shown them to us. Pisanello loved drawing animals, even cows. But apparently just about every Italian court had its own contingent of exotic animals, and apparently everyone hunted with hunting leopards. So by the time Gozzoli was hired to paint his Three Kings with last week's lovely Medici-boy-and-cheetah, he painted some of the animals the Medici had in stock. Others, the leading citizens and those superior in courage, of course, with the princes themselves, moved rapidly through pathless forests to high hills, [armed] with many hunting spears, weapons, and dogs in pursuit of straight-horned stags, foaming boars, tawny lions, or spotted panthers. I suspect that at some point the straightened palace budget had required that the resident hunting-leopards be released into the hunting areas. In fact, I would now doubt that Sophia's welcoming procession even included the required hunting-leopards. One should know that at the arrival of the imperial bride (δεσποίνης νύμφης), whether by land or by water, when the day when she is to be be brought safely into port at The City is known, the emperor, her husband-to-be (ἀνὴρ αὐτῆς ὁ νεόνυμφος) goes to meet her with his father, if he is living; if not, he goes alone. If she comes by land, it is the custom that she alight in the neighborhood of Pēgē; if she comes by ship, near the church of the Blachernes outside the city, where it happens to be suitable. When she arrives at one place or another, the wives of the dignitaries, senators, and the other highest and most well-born archons, welcome the lady and bride-to-be warmly and attend her as an empress. Both the emperors come to meet her, if the bridegroom has no father, he does as has been said. If then she comes by ship, he meets her at the acropolis at the Evgenikos Gate, and if by land, outside the city as has been said. After that, the emperors, or the emperor, leave her there; the wives of the archons mentioned, whether the wives of the despots, or the wives of the sebastokrators, or of the caesars, or of the other well-born, put the red shoes on her. Dressed in the imperial robes prepared in advance, and escorted as an empress, she comes up to the palace on horseback; after that the marriage ceremony is held on the selected day. Equally, one should know this: when the leopard-wranglers (παρδοβάγιλοι) bring in their leopards, they enter the palace on horse, and similarly leave on horse. Also, those bearing the cold drinks enter the palace on horse. This is my translation of the chapter on imperial brides from Pseudo-Kodinos, a book compiled about 1360 with later additions about protocol at the Palaiologan court in Constantinople, and it got me to thinking about Sophia of Montferrat who was so scalded by her marriage to John VIII. He rejected her immediately after the wedding, apparently because he did not like her appearance. But look at the sequence of events in the light of this protocol. 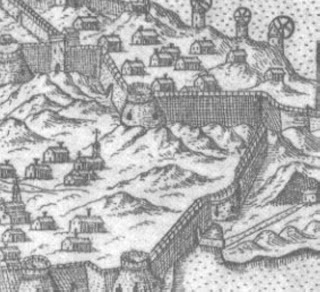 Sophia arrived in Constantinople on a Venetian galley in November of 1420. It docked on the Golden Horn, under the Blachernae, probably about where the pretty little mosque is now. She was welcomed by the court ladies as if she were an empress. She was John's third cousin, her family used Greek names, and she had probably already learned to speak a little Greek. Then John and Manuel arrived. These two slight imperial males dressed as stiffly as icons, and behaving almost as stiffly, greeted her. Then they left and the court ladies put the imperial scarlet shoes on her feet, and dressed her in robes something like her mother-in-law Helena is wearing here. Then they processed along those narrow twisting streets up the steep hill to the Blachernae on horseback, and we know nothing about how Byzantine women sat a horse. If they rode astride like Maria of Trebizond, no one has left any information. The procession was led by the leopard wranglers, and the picture above, identified as young Giuliani de Medici in the Gozzoli fresco below, leads off the processions of the Magi as one of them. The boy was about seven years old when the fresco was painted in 1460, anjd the procession of the Byzantines and John VIII into Florence had happened fourteen years before he was born. He was murdered in the Duomo in 1478 in the Pazzi Conspiracy. That is a shame, but it has nothing to do with us here. The wedding was on 19 January 1421. John was crowned that day -- Pseudo-Kodinos gives meticulous directions for the ceremony, and then, apparently on the next day, John crowned Sophia. Byzantine emperors crowned their wives. He never spoke to her again. Why was there a wedding at all? John had two months between meeting her at the boat, and the ceremonies in Agia Sophia and he must have judged this big blond woman instantly. Would it have been possible for him to have rejected the bride who had been delivered to him (with a great deal in the way of jewels, gold, and financing)? Does "incompatibility" make a non-marriage easier to accomplish? Did anyone tell her what was going on before it happened? 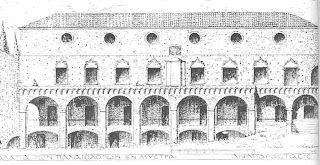 When she left, it was on a Majorcan ship chartered at such short notice that it had to leave the Genoese imports it had been charted for on the wharf. The ship brought Sophia and small group of courtiers across the Golden Horn to Galata, where the Genoese all came down to the waterfront and paid homage to her as their Empress. 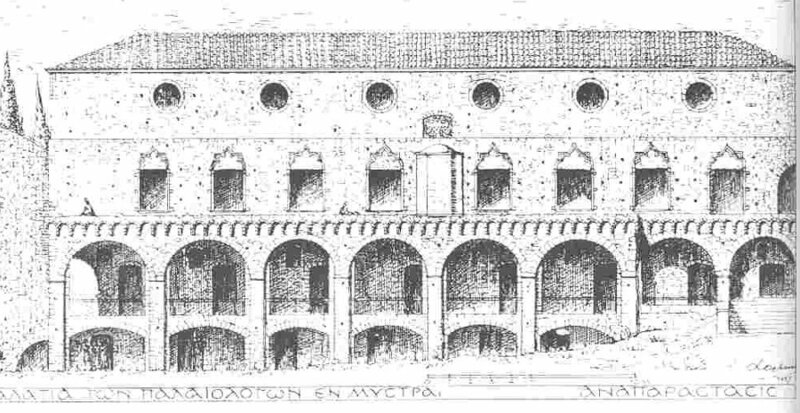 The Majorcan ship took her to Chios, where she was provided a Genoese galley back to Genoa. When she arrived home in Montferrat, she was welcomed as Empress. All the way along, everyone, with the exception of John, was very kind to her. I am giving a paper this weekend at the meeting of the Australian Association for Byzantine Studies at the University of New South Wales in Armindale entitled "The Brides of 1420," in which I will be discussing Sophia's face, and Cleofe's clothes. The animal in the picture above is actually a cheetah (on the ground below it is a leopard), but "cheetah-wrangler" doesn't work in English nearly as well as "leopard-wrangler." Besides, cheetahs were also called "hunting leopards." Nick Nicholas wrote a paper a few years back -- "A Conundrum of Cats: Pards and their relatives in Byzantium," in which he analyzed all the Byzantine terms for members of the cat family, and then tried to identify each one. 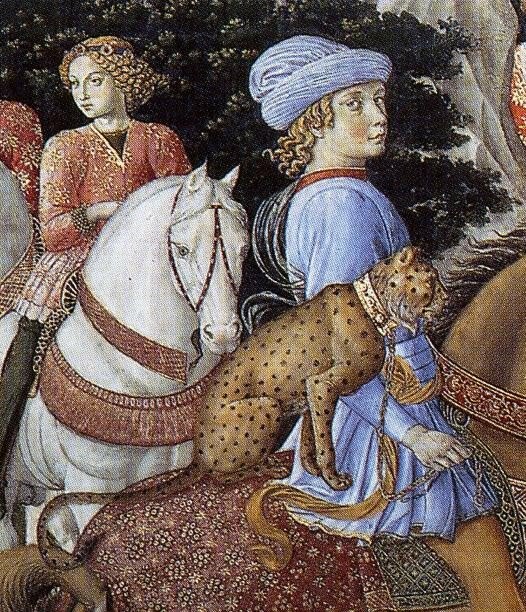 Byzantines called a cheetah a pardos. Gozzoli got it right. 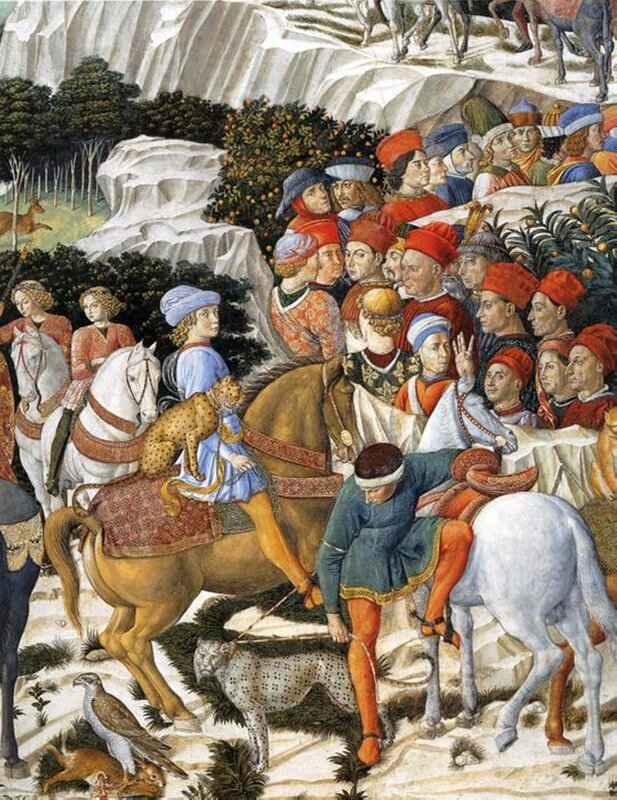 That is, by the way, Benozzo Gozzoli's self-portrait -- the man with the blue and white hat in front of the horse, below. A month ago, I wrote about the great formal staircases constructed by the Venetians which you can see at the top of the next Van Gogh-yellow photograph that I found on the interwebs. (my compliments to the photographer whose name I have lost.). This street passes behind the Venetian armory on the plateia. I mentioned a staircase that went off to the left of it, which you see here above, with one of the jambs that supported a gate. 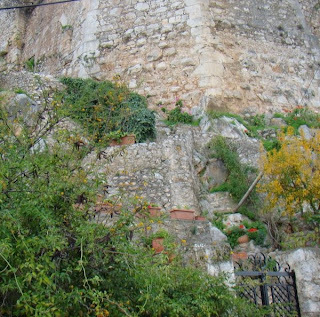 The stairs in that top photograph go up to a narrow street that runs along the face of the hill, and if you follow the street a short way to the left (you will find yourself almost above the mosque at the main plateia), you soon come to a large grassy lot that runs up the hill to the walls of Acro-Nauplion. It is clearly private property with a well-cared-for and nearly-vertical garden, and over six or seven attempts I never found anyone at home. However, it is clear that there are cut stone steps at the back of the garden going on up the hill. This is the yard from above. If you followed the stairs in the first photograph up to the road, you should be standing in front of that house with the terra-cotta coloured doors. 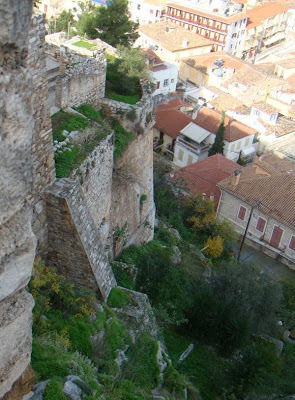 But from Acro-Nauplion, looking down in this view, you should see the arched opening in the tower in the center of the picture. 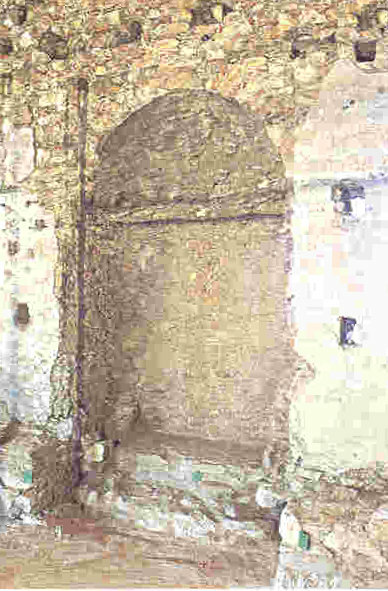 This is a slightly better view of the arched entrance, walled up, but there is no way a person of my sensitivity to private property, and -- most important -- my knees, could have got in a better position. You may be able to see for yourself, but probably you will have to take my word for it, that the stonework of the arch dates it to around 1700. Looking up from the garden fence, this next picture shows the arched opening barely visible in the upper left corner, and shows where the stairs go up from a gate in the garden. Here you can also see that the Venetians of 1713 or so had removed part of the birm from the construction of the 1480s or 1530s, probably because it took up too much room for their construction plans. This all means that the Venetians of the 1686-1715 occupation had taken the trouble to build steps (with a gate, and thus a guard -- top picture) up from the plateia on the hillside, and then reconstruct steps going up the face of the hill to the second gate of the city of Acro-Nauplion. I wrote earlier about the first, main gate. This is the second gate. 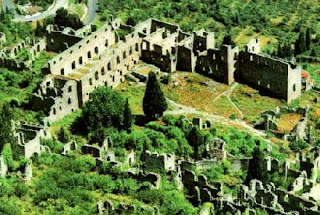 The grand gate of 1713 was the third. This second gate has not, as far as I know, previously been noticed. The pictures suggest why it has been so easy not to notice it. Although the gate exists on the first known map of Nauplion, of 1571 by Camoccio. Which means it was there at least before 1540 when the Venetians had to give up Nauplion. 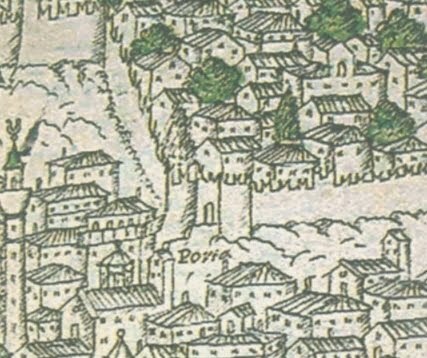 This detail from the Camoccio map may make it slightly clearer. The Google aerial map is of no use here. That is pretty much it for the stairs and gate, except to ask why, if they had those stairs and gate available, and if they had already rebuilt the arch -- probably after enlarging the gate -- why did they then built the grand stairs and formal gate I wrote about before. 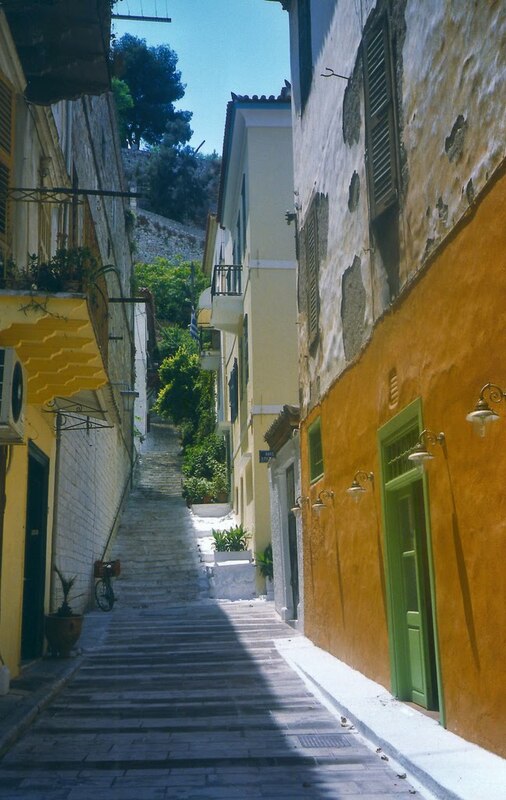 These are steep stairs, both sets of them -- from the little plateia up to the street, and from the street up to the gate. The new grander stairs are less steep and would, I think, allow for horses to be ridden all the way up from the harbor. The grander, less steep stairs would allow for a procession without huffing and puffing, and the Venetians went in for frequent processions. This is speculation. I have not been able to get access to the inside of the wall with that second gate and I don't know when it was filled in. But because of the appearance of the stone, I suspect the Venetians filled it in once that third, grand gate was completed. If you have a chance to look at it more closely, let me know what you think. Much of the research I have been doing has by necessity woven in and around issues of Church Union in the 1420s and 1430s. I have written here of an emperor shattered and a bride broken in its name, of men embittered, and of one turned great. But for this year -- and amazingly, for next -- the churches of East and West are united in sharing the day of the Easter feast, united in the centrality of their symbol of the cross. For the Greeks, as Paul wrote, foolishness. Humiliation become triumph, torture become healing. For this day I offer a gleaning of Greek crosses -- apotropaic, spolia, one representing all those painted crosses in all those olive-scented churches, one a church constructed as a cross. Spolia at Tegea, cross and monogram.